You hear often in marketing circles about the value of hiring journalists to support — even lead — corporate content marketing programs. Many of the marketing strategists and content directors here at Hanley Wood Marketing are journalists by early professional training, so we’re definitely strong believers in the idea. So, too, is Travis Justice. With two decades of experience in TV and radio broadcasting, Justice recently made a career move into corporate marketing, taking a job with MCL Construction, an Omaha, Neb., building contractor. Today he spearheads a content strategy that leans heavily toward his core competencies, video and audio storytelling. And as we discovered recently during a discussion in the B2B Content Marketing group on LinkedIn, he and MCL are redefining what it means to share their valuable content. Q1: Give us an overview of your content strategy and cadence at MCL Construction? A: I spent 20 years on TV and radio so my company’s content strategy is heavy into video and podcasting and light on blogging. My journey to producing content for MCL started when I realized I needed to find a different way to drive business development. Having the skill set of being able to write, shoot and edit stories, I convinced our company president that this was the right direction. Right now I am producing one to two videos per week. I promote them in a targeted way to our e-mail list of business owners, architects, developers and subcontractors. We also distribute the videos on our social medial channels, including Facebook, Twitter, Google Plus and LinkedIn. The videos range from project updates, to project completions, to construction tips. We also have a year-long campaign going in 2012. In celebration of MCL’s 25th anniversary, I’m producing a monthly video that features employees. Our brand is “The people you build with.” This campaign shows our people outside of work, doing what they love in a personal setting. Q2: You’re taking a somewhat different approach to “sharing” content. Tell us about that. A: I try to shoot each project at least four times. That way I can show it in a good number of stages. Each time I produce a video I brand it MCL, but also with the lead architect and their logo. Ninety-five percent of the time the architect will use the very same video I produced on their website and social media channels. I also share the video with our main clients, the business or building owners, so it can serve as a marketing tool for them, including as content they distribute to employees and investors. I really see a huge impact with our non-profit and religious clients in their fundraising. They use the videos for project updates to stakeholders, and to ask for more support to help drive their missions. At the end of a project I give the owner and the architect all the raw video free to use for their own marketing purposes. They all understand the value, as video production is expensive. Not having to pay for it is a bonus to them. So it helps foster a good working relationship. One more thing I’m doing is including project partners, subcontractors, in our stories. Interviewing them on the job, but also making the story a little about them. If you go to our YouTube channel, or our media channel on mclconstruction.com, check out the Drake Williams Steel story. This is a piece about how MCL selects quality subcontractors to do our work. It was a hit with architects, as they ask a lot about our subcontracted work. It was also a hit for Drake Williams, because it showcased their company. And again, they get all the raw video and can produce their own video or contact me to customize it for them. I guess you could say we’re not just trying to create content at MCL. We’re trying to build partnerships and relationships. Q3: You attribute $15 million of new business to your content marketing efforts to date. How so? A: The last shoot I do on a project is always with the owner of the company we’re building for. This way I’m sure to get their testimonial on video. I now have a testimonial library where our clients not only talk about the quality of construction work MCL produces, but how our videos benefited their communications process. When MCL is being considered as the contractor for a new construction project, this “shared content marketing strategy” is always part of our presentation during the final contractor selection interviews. This is good because the owner and the architect are involved in the interview process. When I show them how they benefit from a content standpoint, their eyes light up. The interviews in which we’ve presented the shared content strategy, we’ve won the business. And in the last year that is $15 million worth of work. Is it 100 percent what closes the deal? No, and it shouldn’t be. But it’s something nobody else in our field is doing, so it allows us to stand out. When we ask for feedback from the interviews, sharing content is one of the first things that comes up. A: The Digital Age has allowed us to produce great looking and great sounding content. I use a high end Sony HD camcorder that has a mic input. This allows me to use a wireless microphone on interviews and get a much better audio recording than using the camera microphone. My editing system is an EDIUS, a Grass Valley product. I have a studio microphone for podcasts and a dual mic digital recorder when I conduct podcast interviews in the field. For video distribution I use YouTube and Vimeo. For podcast distribution I use Sound Cloud and for my email campaigns, Constant Contact. I keep adding gadgets and gizmos, but I’d say the total investment to date is $5,000. That’s a very small investment to be able to produce the quality of content we have. Q5: If we’re reading your LinkedIn profile correctly, you’re the director of business development at MCL, you host a morning sports talk show on radio, and you own a coffee shop. When do you sleep? A: It should also say I have four kids ranging in age from 16 all the way down to 5. Believe it or not, my schedule is a lot lighter now than it was three years ago. I’m finally getting six to seven hours of sleep a night! It’s all good. In fact, it’s never been better. This post, originally published on Hanley Wood Marketing’s Content Is Marketing blog, is cross-posted here for subscribers to Touch Point City. For more marketing ideas and insights from my colleagues at HWM, be sure and subscribe to Content Is Marketing. Should the CEO be Contributing More to Your Content? What role should your organization’s CEO play in your content marketing? No, that’s not a typo. I don’t mean the chief marketing officer (CMO) or chief content officer (CCO). I mean your CEO. The big guy or gal. We talk a lot in content marketing circles about the importance of humanizing our organizations. Putting a face(s) and a voice(s) to the brand. Becoming more accessible to key audiences. Being in community and dialogue with customers and prospective customers. You’ll see quite a few companies having their CMOs, key managers, scientists and technologists author blogs and white papers, or present webinars and seminars. But what about the CEO? This question sprang to mind last week when global PR firm Weber Shandwick released the second installment of a study it calls The Company Behind the Brand. They surveyed nearly 2,000 consumers and business executives in the United States, the United Kingdom, China and Brazil. The executives interviewed lead enterprise-class companies ($500 million+ annual revenue). 66 percent said their perception of the CEO affects their opinion of a company’s reputation. On average, 59 percent said their perception of a company is influenced by what the top leaders communicate (this number was 64 percent in China, and 72 percent in Brazil). Estimate that as much as 60 percent of a company’s market value hinges on corporate reputation. Said that 49 percent of corporate reputation derives from the CEO’s reputation. To simplify, the research seems to suggest (affirm?) that consumers value hearing from executives, and what they think and feel about a company has a lot to do with what those leaders say and do. Meanwhile, execs concede the financial performance of their companies has much to do with reputation — both theirs and the company’s. Here’s a quote from Weber Shandwick’s news release, seeking to put the research in an overall business context: “Gone are the days when purchases were made solely on product attributes. Today’s consumer is savvy, well informed and privy to a plethora of purchase options. Decisions are now increasingly based on additional factors such as the company behind the brand, what the company stands for and even the standing of its senior leaders,” said Leslie Gaines-Ross, chief reputation strategist. Is There a Role to Play? CEOs — especially those who are also the company founder, or the inventor of the core technology or business model — are often among the clearest thinkers and most insightful speakers about the customer’s pain points and the pros and cons of competing solutions. Your CEO doesn’t have to look like a fashion model, or speak like a news anchor, to be comfortable and effective in a content marketing role. You can channel his or her vision, voice and insights via a content format that plays to their strengths. Video. Podcast. Webinar. White paper. It’s hard to argue content marketing isn’t important or strategic enough to merit the CEO’s time and attention. For many organizations — especially B2B companies — their content marketing strategy represents the best of what the company wants to stand for as a thought-leading, customer-centric brand. Not to suggest that your CEO should suddenly become the dominant voice and face of your content. But where might it make sense to involve your CEO more — maybe for the first time? Fielding questions during a quarterly town hall video conference with dealers, franchisees or users. Authoring, with the help of your strategic content agency or staff, an annual state-of-the-industry research and issues report. Publishing a once-weekly blog post that becomes a cornerstone of your blog cadence. Is it time to ask what content can do for your CEO, and what your CEO can do for your content? What do you think — horrible idea or worth considering? Maybe your CEO is already a major contributor to your content marketing. Any favorite examples of CEOs who are front and center doing content marketing effectively? Comments, critique and case examples welcome. This post originally published on Content Is Marketing, Hanley Wood Marketing’s blog. In its The State of Content Marketing, 2012 study, Outbrain found that 100 percent of brand marketers and agencies surveyed said they are doing content marketing. If you’re like me, you’ve been nodding and smiling knowingly in recent years each time you’ve seen a study that showed content being increasingly adopted and valued as a marketing strategy. For example, Content Marketing Institute and Marketing Profs, for two years running, have conducted a survey which found that nine in 10 marketers say they market with content. Now comes Outbrain with its 2012 survey, showing unanimous adoption of content. What does it mean for you and your content strategy if everyone is doing content marketing? I’ll admit, my first reaction at hearing that content marketing has reached 100 percent adoption was doubt. Really? Are we working off the same definition here? Show me the exact wording of the survey question. If I’ve got a corporate website and a sales brochure, can’t I claim to be “doing content”? But putting aside skepticism for a moment, let’s say it’s true: 100 percent of corporate marketers and their agencies are now “on” to the transformational power of great content. That organizations large and small can win, and win big, when instead of pounding away at their audiences with purely promotional, product-centric messaging, they market for them — by providing relevant, value-adding information, interactions and experiences. If 100 percent of marketers today not only understand that distinction, but have truly begun to embrace it and act upon it, then we’ve entered a new era in the evolution of content marketing. The era of Competing on Content. In the National Hockey League coaches speak of “battle level.” Which team’s players came to the arena prepared to out-hustle, out-work and, yes, regrettably, even sometimes out-scrap the other team? Ask most newspaper journalists who’ve worked in, or still work, in a city with two or more competing papers. They’ll tell you that competition to deliver the best content and value to readers challenges them (the journalists) to be better, which in turn serves readers better. Looking to get the scoop. Striving to write the more insightful opinion piece. And then watching subscription and single-copy sales numbers act as the KPI dashboard for who is serving the audience more effectively. In the era of Competing on Content, we content marketers will need to find our own definition of “battle level.” If we hope to earn the engagement and loyalty of more customers, we’ll need come to work with a mindset that we’re going to out-think, out-imagine, out-create, maybe even out-scoop our competitors. Be more customer-centric. Be more willing to experiment, measure, improve, and repeat. In short, we’ll need to push ourselves to have — and then continuously sharpen and evolve — a clearly superior strategic vision when it comes to planning, production and distribution of content within our respective product or service categories. Doug Kessler, founder and creative director of UK marketing firm Velocity, recently described what he sees as 10 implications of “the mainstreaming of content marketing.” His is a thought-provoking post well worth a read. In this post I won’t offer any tips for how to push your content thinking and doing to new heights. What I simply wanted to do here is provide you a heads up. And, maybe, a little motivational call to mission. If it’s not happening already, there’s probably going to be soon a content competition within your category. Which brand will consistently produce the best content? Which content marketer will consistently excel at the vision test? 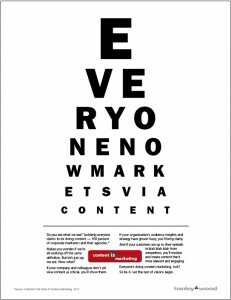 This post originally published on HWM’s Content Is Marketing blog, where you can download the “vision test” poster.